Prague is one of Europe’s most enchanting capital cities and this private full-day tour is ideal for first-time visitors, with a custom-made itinerary that takes in all the highlights in just one day. 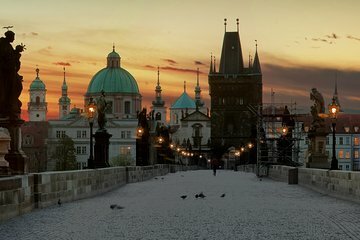 Explore the UNESCO-listed historic center, walk across the Charles Bridge, pose for photos by the John Lennon Wall, and marvel at architectural wonders such as Prague Castle, Strahov Monastery, and St Nicholas’ Cathedral. This is a fully private tour, departure time is individually set by each client. Your day in Prague begins with pick-up from your Prague hotel by your private guide. Depending on the tour option chosen, you’ll then set out to explore the city, either on foot or by private vehicle. Your itinerary can be customised to suit your preferences, so perhaps start by exploring the UNESCO-listed historic center, passing monuments such as the Powder Gate, the Astronomical Clock, and the Old Town Square. Then, stroll through the Jewish Quarter, or head down to Wenceslas Square and the New Town to admire architectural gems such as the National Theatre, the New Town Hall, and the unique ‘Dancing House’. Pose for photos on the famous Charles Bridge and take in the views along the Vltava River as you cross into the Lesser Town, then hear more about Prague’s rich history as you wander the maze-like streets and visit the legendary John Lennon Wall. Escape the crowds to walk around the hilltop Petrin Park, where you could climb the Petrin Tower for a spectacular view over the city or take a tour of the Strahov Monastery (own expense). Make sure you don’t miss the city’s star attraction – Prague Castle, one of the world’s biggest castle complexes, where you’ll see Gothic and Renaissance masterpieces such as St Vitus Cathedral, Hradcani Castle, and the Golden Lane. After a full day exploring Prague’s highlights, your guide will take you back to your hotel. Lenka was amazing! She was so fun to explore the city with, had a lot of knowledge base - sometimes it felt like we couldn't wander too far outside the itinerary she had in mind, but with how short of a time we had scheduled together I suppose that did require us to stay on schedule. She was really flexible as far as being willing to be on camera for my travel blog and I would recommend her to anyone. It was fun to get her personal take on the city as well and hear her stories of growing up in the area we were exploring. Any first time visitor to Prague must sign on for this. We had a great experience every where else except Prague. The guide was not knowledgeable and we asked her to take us to specific places and she refused. In addition the car used was a small BMW and it was hard to see out the back. We ended the tour an hour early. My wife and I spent a few days in the Czech Republic and Austria. Not all tour guides and companies are the same. We started our vacation paying a modest price only to find out at the end we had the C Team. Tours may charge a little more but it is well worth it. There is a saying in Spain, Lo barato sale caro. This means don't always settle for the lowest price. In our case the difference was negligible. If I would go back in time, I would choose all with Lucy Tours. They ALWAYS answered my calls. I rarely give anyone 5 stars. This is well deserved. The owner took extra time to come say hello and took a picture with us. What more can you want? That is the level of service they provide. Our tour was given by Lucy, owner/operator of Lucy Tours. Lucy was fantastic. She was very knowledgeable of the city and region. We learned a ton about the history of the Czech Republic and the city of Prague. Lucy's tour was at a great pace and even allowed for us to see some sites not on the tour. Additionally, we had a good personal rapport with Lucy which allowed us to learn more about the city and country through Lucy's own personal experiences. We could not have asked for anything else. I would highly recommended Lucy and Lucy Tours if you have the chance to book with them.